Where to find us – a summer long! Here they are, our gigs for the summer 2016! From the end of May to the middle of September, the high season of open-air concerts awaits us! We’ll start at home, coming back after 3 years to our favorite venue: Stustaculum, on May 26th (Fronleichnam). It will be a great ska night together with Sentilo Sono in Festzelt! 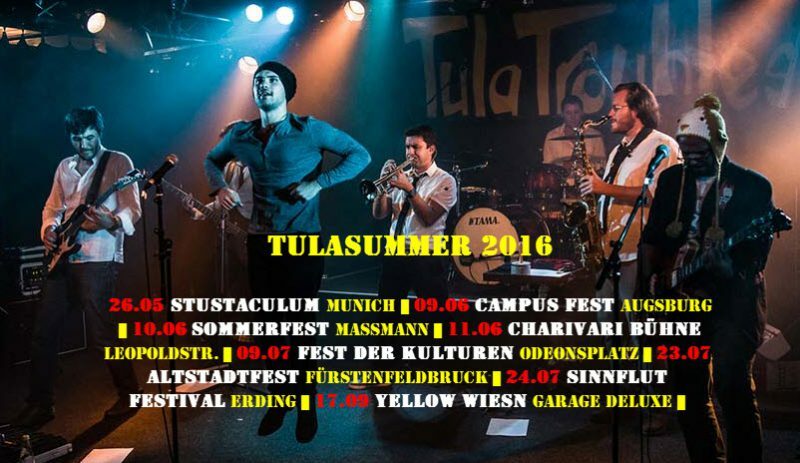 Two more student events will follow in June, the Jura-Campus-Fete in Augsburg and the well-known Sommerfest in the Maßmannwohnheim. We have the honor to perform twice on Saturday evening in the very center of Munich: on June 11th at Münchener Freiheit for Radio Charivari (introducing the charts-star Max Giesinger) and on July 9th in prime time at Odeonsplatz. Further highlights are the Sinnflut Festival in Erding and the Altstadt Fest in Fürstenfeldbruck. Like for every other Münchener, summer will officially end also for us on the first day of Oktoberfest with our first indoor gig for the Yellow Wiesn. More dates are very likely to be arranged – we will of course add them here!